Changwon Fatima Hospital celebrated the 45th Anniversary of its foundation in the main Auditorium of the Hospital on Sept. 1st. Many employees, doctors, nurses and administration staff members attended the event. In the opening ceremony, some employees received an award prize for their service, 4 employees for their 40 years of service, three for their 30 years and 26 for their 10 years. Along with their acknowledgments, there was also an installation of the seventh Medical Director, Dr. Cheong WonCho replacing Dr. Kim JunHo. CEO Sr. Vianney Park gave a keynote speech highlighting the plan of the Hospital had made a year ago and how far it had achieved its goals. 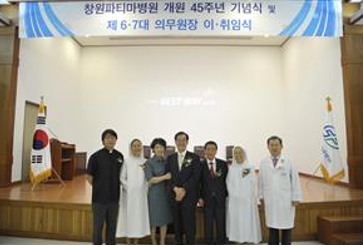 “Many struggles were made to increase the awareness of being a Catholic Hospital, to achieve an efficient health treatment service and the maintenance of good reputation of Changwon Fatima Hospital in the city. My most sincere thanks go to each one of you who made this a daily reality.” Said CEO Sr.Vianney Park.